Over the past few months the recipients of the Engage Intervention Fund have been working on their respective projects. Here are some updates. In partnership with local AIDS Service Organizations, community groups and health care providers, Black CAP hopes to deepen their understanding of the knowledge, attitudes and behaviours that influence PrEP uptake among local African, Caribbean and Black MSM. We are planning to have their the first Community Advisory Board (CAB) meeting in of April to introduce the project’s focus and objectives, identify opportunities and challenges, and explore ideas for the future of the campaign. They have sent out invitations to potential members to join the CAB and will have representatives from PrEP Squad, Washington, DC to provide guidance on all elements of the project. Working alongside the Community-Based Research Centre’s (CBRC) Investigaytors program, the Community PrEP Champions are working to raise awareness about PrEP and creating a knowledge translation toolkit to empower young queer men to access PrEP through their primary care provider. In addition to producing targeted resources, the group will build capacity for research and knowledge translation among young queer guys in the Vancouver Lower Mainland. Since beginning the Community PrEP Champions project in October, the Investigaytors have held four meetings during which the Community PrEP Champions established community guidelines and expectations, used thematic analysis to interpret results from a qualitative research study with young queer guys accessing PrEP at Health Initiative for Men’s (HIM) Health Centre, and participated in a knowledge translation workshop. The workshop uses examples from gay men’s health in Canada and will be available open source through CBRC. In March, the group will hold a PrEP boot camp where participants will meet with mentors from the Centre for Excellence in HIV/AIDS and the BC Centre for Disease Control to learn more about PrEP and to design the knowledge translation toolkit. 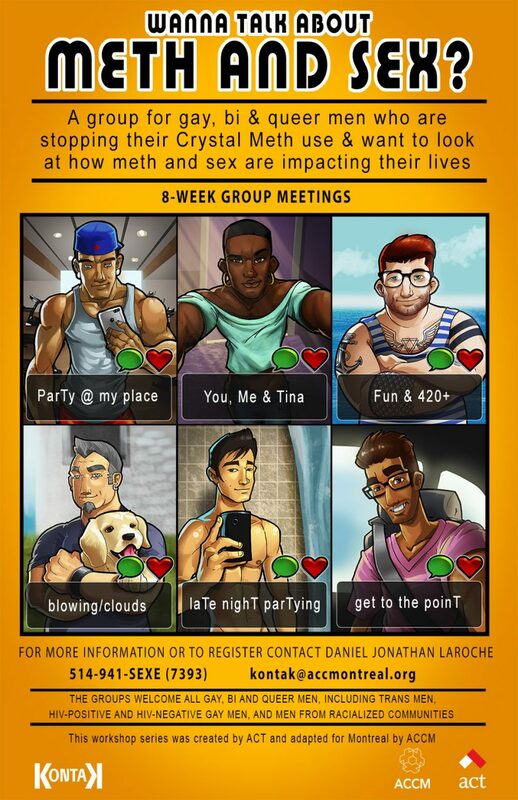 Launched in September 2017, the MONBUZZ.ca intervention tool aims to reduce risky behaviours and harms associated with substances users (SU) in MSMSU who do not consult the institutional health services, particularly the link between substances users and sexual behaviors, and encourage referrals to services better adjusted to their needs. The intervention fund is being used to improve the MONBUZZ.ca website in order to maximize the uptake of this risk-evaluation tool in the community. RÉZO is working on changes to monbuzz.ca this month and they intend to release the new version in March. MAXOttawa and EMHC have joined the project and with their help, monbuzz.ca will not only be bilingual, but community workers in Edmonton and Ottawa will be able to intervene with the guys from their respective regions.